"I have worked to free shape from its ground, and then to work the shape so that it has a definite relationship to the space around it; so that it has a clarity and a measure within itself of its parts (angles, curves, edges and mass); and so that, with color and tonality, the shape finds its own space and always demands its freedom and separateness." 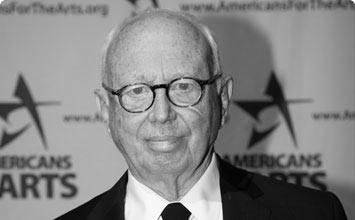 Ellsworth Kelly has been a widely influential force in the post-war art world. He first rose to critical acclaim in the 1950s with his bright, multi-paneled and largely monochromatic canvases. Maintaining a persistent focus on the dynamic relationships between shape, form and color, Kelly was one of the first artists to create irregularly shaped canvases. His subsequent layered reliefs, flat sculptures, and line drawings further challenged viewers' conceptions of space. While not adhering to any one artistic movement, Kelly vitally influenced the development of Minimalism, Hard-edge painting, Color Field, and Pop art. Kelly intends for viewers to experience his artwork with instinctive, physical responses to the work's structure, color, and surrounding space rather than with contextual or interpretive analysis. He encourages a kind of silent encounter, or bodily participation by the viewer with the artwork, chiefly by presenting bold and contrasting colors free of gestural brushstrokes or recognizable imagery, panels protruding gracefully from the wall, and irregular forms inhabiting space as confidently as the viewer before them. Real-life observations are the backbone of Kelly's abstraction works, which are replications of the shapes, shadows, and other visual sensations he experiences in the world around him. As did the early-20th-century Dadaists, Kelly delights in the spontaneous, the casual, and the ephemeral means of finding such "readymade" subjects. The subtle fluctuation between the meditative, decorative and industrial in much of Kelly's work can be traced in part to this design training in art school. In this sense, Kelly continues Henri Matisse's lyrical and decorative ideal of creating an art of visual serenity, even as the painted motif is now reduced to its simplest and sometimes most mysterious configuration. The special camouflage unit of which Kelly was a part during his service in World War II, and the principles of visual scrambling he undertook, has also contributed greatly to Kelly's intense visual motifs. 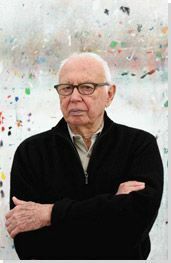 Born in Newburgh, New York in 1923, Ellsworth Kelly was the second of three boys. He grew up in northern New Jersey, where he spent much of his time alone, often watching birds and insects. These observations of nature would later inform his unique way of creating and looking at art. After graduating from high school, he studied technical art and design at the Pratt Institute from 1941-1942. His parents, an insurance company executive and a teacher, were practical and supported his art career only if he pursued this technical training. In 1943, Kelly enlisted in the army and joined the camouflage unit called "the Ghost Army," which had among its members many artists and designers. The unit's task was to misdirect enemy soldiers with inflatable tanks. While in the army, Kelly served in France, England and Germany, including a brief stay in Paris. His visual experiences with camouflage and shadows, as well as his short time in Paris strongly impacted Kelly's aesthetic and future career path. The large-scale Colors for a Large Wall is one of Kelly's early forays into multi-panel paintings, a fundamental motif throughout his career. Colors for a Large Wall helped introduce his deeply held view of paintings as objects; not only was this painting an object in itself, but it was comprised of many smaller objects (panels) supposedly having come together in chance collision. In this work, Kelly covered each of the 64 square canvases in a single color and fused them together based on a collage study he had arbitrarily arranged. Much of Kelly's subsequent work stemmed from this painting, as he continued to juxtapose panels of differing sizes, shapes, colors and materials in innumerable variations. In Paris, artists such as John Cage and Hans Arp encouraged Kelly to experiment with the idea of chance in his artwork. For Cite, Kelly cut a black and white brushstroke drawing into twenty squares and randomly rearranged the pieces. He then turned this composition upside down and painted it onto twenty wood panels. After rearranging it once more, he connected the panels into the final painting. Although his artistic decisions ultimately dictate the final composition, Kelly's use of chance partially disconnects him from the resulting work. Such efforts to reduce the artist's emotions, influence, or individual marks have been important facets of Kelly's artwork, suggesting that all apparently "controlled" creativity is always partly a matter of an artist's making the most of chance collisions with unexpected and impersonal forces. Kelly put great emphasis on the tensions between the 'figure' and the 'ground' in his paintings, aiming to establish dynamism within otherwise flat surfaces. In Red Blue Green, part of his crucial series exploring this motif, Kelly's sharply delineated, bold red and blue shapes both contrast and resonate with the solid green background, taking natural forms as inspiration. The relationship between the two balanced forms and the surrounding color anticipates the powerful depth that defined Kelly's later relief paintings. Therefore, these works serve an important bridge connecting his flat, multi-panel paintings to his sculptural, layered works. Upon returning to New York after six influential years in Paris, Kelly progressed beyond his multiple-panel paintings to reliefs. Black over Blue, first exhibited in the Betty Parsons Gallery, reflects his recurring interest in both layered works and non-traditionally shaped canvases. His paintings are often hung away from the wall, giving them a three-dimensional, sculptural quality. In fact, the painting's interaction with the wall was a strong focus for Kelly. In Black over Blue, the curved, black panel extends beyond the confines of the rectangular blue canvas, making the surrounding wall an essential part of the composition. Wall, artwork, and space itself become nearly equally important aspects of the viewer's experience, finally leading to a heightened awareness of one's own body as a similar, energized "gesture" in the same architectural setting. During the 1970s and 1980s, inspired by his move to the pastoral upstate New York, Kelly began expanding his use of the curve and making large, totem-like sculptures - many designed to be displayed outdoors. The 12-foot tall, slightly curving Creueta del Coll reflects both of these important new directions in his work.Kelly created a highly abstracted version of a specific, recognizable form - in this case, an ancient Greek statuary form known as kouros, or male youth. Like many of Kelly's sculptures, this one and a half inch-thick piece painted matte-black is very flat and has a two-dimensional quality. He encouraged his viewers to question traditional perspectives by creating sculptural paintings that might sit on the floor and flat sculptures that lean against a wall. In the 1990s, Kelly further developed the possibilities of the relief and continues expanding on this motif today. Red Diagonal employs a striking, geometric construction that echoes the forms created by his earlier panels attached side-by-side. At the same time, these layered pieces extend away from the wall, cutting into the viewer's space. His careful placement of the overlapping canvases creates precise, yet varying shapes in both the positive and negative space.